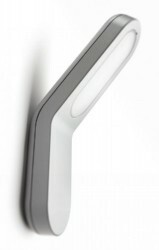 16910-87-16 Finish: Grey Pictured in Grey This sleek family of wall lights and posts casts a generous pool of natural white light downwards thanks to an angled flat head on top of the upright pillar. They’re ideal for illuminating gardens, pathways, decking or paved areas. Features: -Wall lantern. -Ecomoods range. -Available in grey or anthracite colour. -Material: Aluminum. -Light colour: 2700k. -Saves up to 80pct energy saving. -Made with robust and reliable high quality material. -Ultra long lamp lifetime last up to 20,000 hours. -Premium and elegant materials – Each piece is constructed from high quality components and hard wearing materials like die-cast aluminium and stainless steel. -A full range of available applications – Ideal for a garden, terrace, pathway or balcony, outdoor’s wall, post, pedestal and ceiling lights. -Stylish modern designs. -Welcoming warm white light glow – The light colour temperature is 2700 Kelvin it also provides plenty of light for clear visibility . -Easy installation – This article is delivered with a torx key to be used during installation. -IP 44, designed for outdoor use. -Class of protection: I. -Guaranteed: 2 year(s). Specifications: -Accommodates 1 x 2G7 11W bulb (included). -IP44 rated. -Energy consumption: 1 x 11 W. -Power supply: 220-240 V, 50/60 Hz. -Overall dimensions: 21 cm W x 11 cm D.